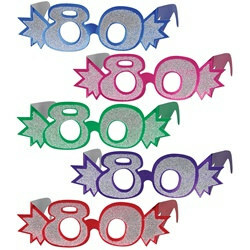 Celebrate your 80th birthday when you, your closest friends and family wear the Assorted "80" Glittered Foil Eyeglasses. These eyeglasses are comfortable to wear and still give you plenty of vision. The "80" Glittered Foil Eyeglasses come in assorted colors such as red, purple, green, cerise and blue and each pair of glasses is covered in glitter. There is no way anyone could miss you and once all of your guests dawn on a pair of these glasses, you are sure to have an amazing party. Neat item to use in a party, not expensive so can have one for everyone! Quick TAT on shipping. Packaged well for shipping. It's difficult to find cool and funny things for folks turning 80 -- it's as if most party stores think you have to take this birthday seriously. Well, my family takes nothing seriously, so these are perfect! Thanks you so much, Party Cheap! Very happy with these! Great price and delivery time was very fast! I wasn't anticipating paper glasses but never the less they were cute. I wish I could have chosen the color though.